The best part of a complete FAIL is the nice publicity it gets you. I got a real review from somebody who is not a friend or family member! Maybe it's not technically a review, but to me it's just as good! It's at Deaf Dogs and Benevolent Gnomes. Stranger things have happened. But not to me! I tried to grow food from garbage. It led to some interesting discoveries, but overall: FAIL. People post this stuff on the internet and all I have to say: They have nothing else to do if this worked for them. Even when I owned a garden center and my main job was to grow stuff and keep it alive - this project fell through the cracks. Yep, people have been trying this since BEFORE the web! It must have been the Elizabethan period, before everything landed on your screen with directions. People had the THINK of ways to make something work and maybe TALK to their friends and get everyone thinking. In third grade we watched a filmstrip (remember those?) where a boy filled a container with rocks, leaves and dead grasshoppers and grew bean seeds in it. This was supposed to demonstrate to us how soil is made. It was a black and white film. Surely they didn't have special effects back then? The stuff in the shreds and grass didn't grow very well, but the soil I put on top was mud I dug from the yard. The entire contents of the container sank about four inches within two weeks. That's when I called it a failure and gave up, but as usual I didn't clean it up or dump it for a while. Continuing with the idea that plants might grow in the raw components of soil, I also dumped a lot of vegetable scraps, coffee grounds, etc. into a big, 10-gallon nursery container. 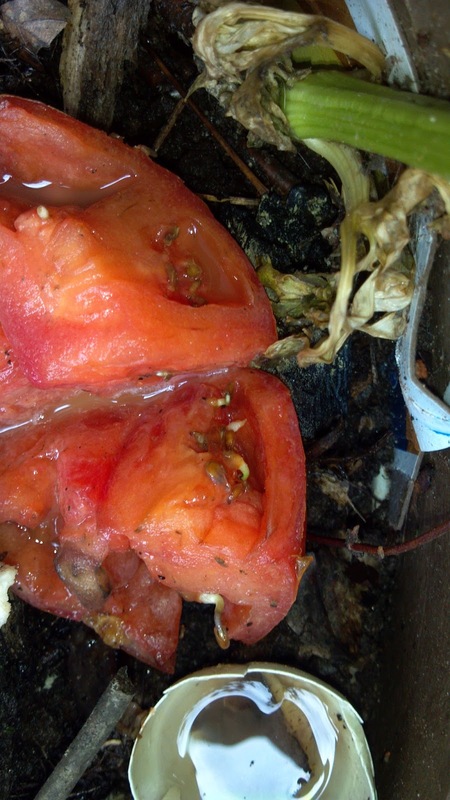 Stuff didn't grow in my uncomposted soil elements. It attracted yellow jackets and smelled bad. Slime oozed out of the bottom. Ooz that I couldn't wash off with a hose and scrub brush. I tried the "plant a celery stub" trick. Maybe that has to be done in cool zones. 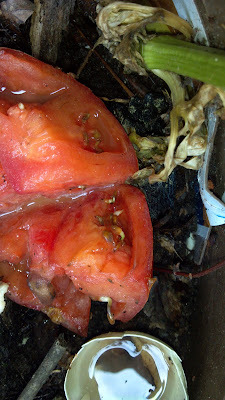 Inside one of the tomatoes, the seeds had already sprouted. I felt like this was fool proof. Turns out, a fool can kill them. The only tomato sprout that lived was the one I transferred to a cellpack of real soil and put it with the other bedding plants. 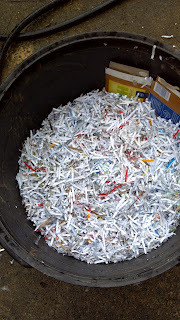 After another couple weeks, I revisited the shredded paper pots. It's good to have two failing projects at once so there is always another crisis to distract you from the current failure. 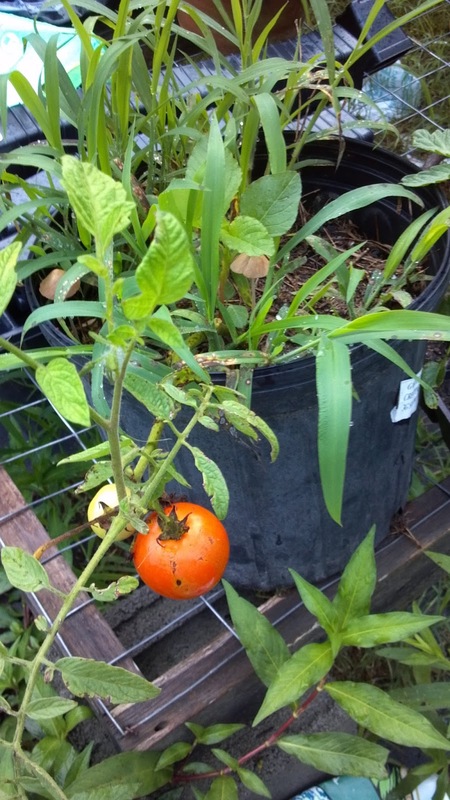 I filled the tops of the containers with potting soil and planted a tomato plant in one. I planted it deeply, all the way down with the rootball in the shreds. The first tomato I picked this summer was from that plant. Success! 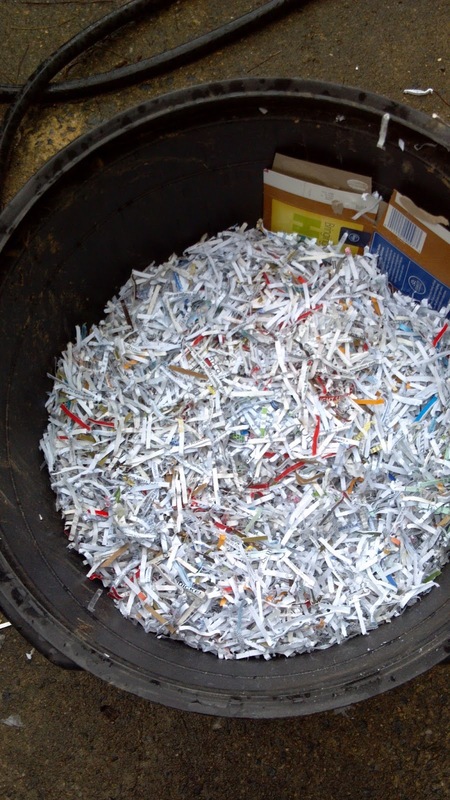 Paper shreds and grass clippings. They meet our get-ahead criteria: They improve the appearance of our habitat with plants. They help us financially by growing groceries and trimming soil costs. They help provide whatever gourmet vegetable you love but can't find at the store. 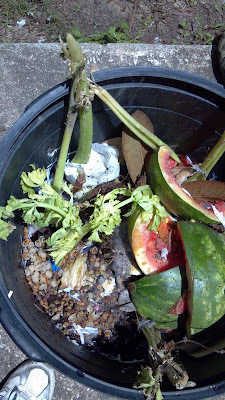 I couldn't get kitchen scraps to grow, either. Glad to know it's not just me. Another of society's standards that I failed. Or maybe it's just the media's standards? Very interesting. I enjoyed reading this very much.